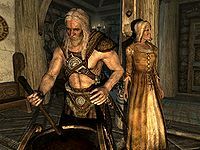 The Gray-Manes are an old and influential clan in Whiterun. Before the Civil War, the Gray-Manes were friends with their equally venerable neighbors, clan Battle-Born. However, the Gray-Manes have become strong supporters of the Stormcloaks, as well as Ulfric Stormcloak. The Battle-Borns sided with the Empire, and so now the clans are feuding. New visitors to Whiterun will probably be caught off-guard by the question "Gray-Mane, or Battle-Born?" as the clans try to assess where you stand in the war. As a side-note, answering this question with the side that the asker represents will make this person considered a "friend" and allow a bonus to be attained using the Ebony Blade. Eorlund Gray-Mane is probably the clan's most renowned member, being the master smith at Whiterun's Skyforge. House Gray-Mane can be found near the Temple of Kynareth in Whiterun. This page was last modified on 13 November 2013, at 08:20.